Olympic spirit? Bank on it! 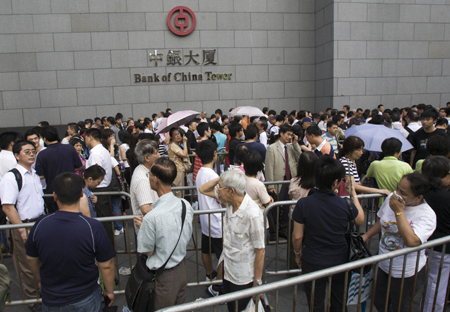 HONG KONG - Thousands formed long queues outside Bank of China branches across Hong Kong on July 15, 2008, in a feverish bid to snap up special-edition HK$20 Olympic banknotes more than a day before their official release. Residents including young children and pensioners flocked to the city's main Bank of China branch in the financial hub of Central at the crack of dawn, some hunkering down inside tents for a lengthy wait behind metal barricades. "I came with my friends because the Olympic banknotes have commemorative value," said Ken Yip, a 15-year-old who was playing with a Rubik's cube inside a blue tent stacked with snacks and comics. Four million of the HK$20 ($2.56) Olympic banknotes will be issued, depicting a Greek pillar on the front and Beijing's Olympic "Bird's Nest" stadium on the other side. China's central bank also issued six million new 10 yuan ($1.46) notes to mark next month's Olympic Games. Long queues had begun forming early on Monday, more than 48 hours before the banknotes were due to be issued on Wednesday.